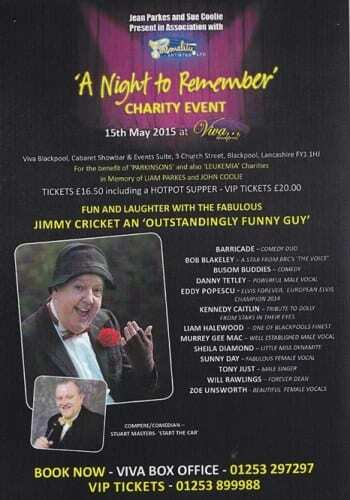 Photos and postings published on social media websites have revealed some of the events that made Jimmy Cricket a household name. The Northern Irish entertainer’s supporters and friends have created a kind of nostalgia corner with their entries on Facebook and Twitter. Right is a picture of the front cover of the Look in annual dating back to 1988. Look in was a popular weekly magazine aimed at the teenage markets during the 1980s. Jimmy features primarily because he had a popular television series on ITV at the time and the magazine decided to run a comic strip which featured Jimmy’s character getting into different scrapes! A big thanks to Amy Elizabeth Phillips for posting this on her website at www.varietyemporium.co.uk where it features on its dedicated Facebook page. 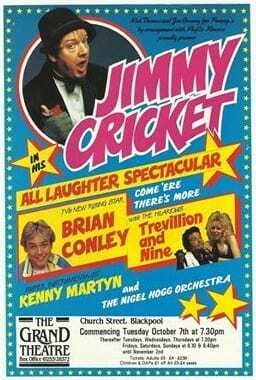 Back in 1987, Jimmy headlined a show at the Grand Theatre in Blackpool which was a trailblazer at the time as it started a trend of extending theatre-based entertainment attractions into the autumnal illuminations season (poster left, is also from the Variety Emporium website). 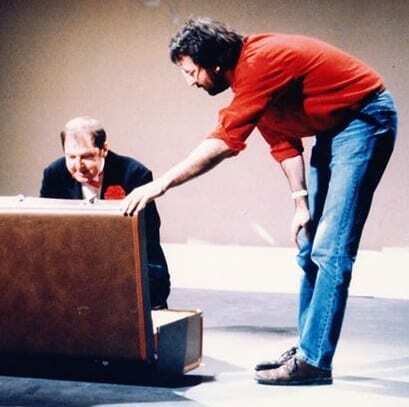 Supporting Jimmy on the show was none other than Brian Conley, the English comedian, television presenter, singer and actor who at the peak of his television career was believed to be the highest-paid male television personality in the UK. Alongside both Jimmy and Brian was a double act called Trevillion & Nine – the female half of which was Sadie Nice who is now a successful broadcaster on BBC Essex. The other member of the double act, Paul Trevillion, went on to use his artistic talents to the full, producing cartoons for a range of sporting occasions and sporting publications. Irish entertainer Jimmy Cricket went back to the 1980s as he joined in with a rendition of A-ha’s Take on Me – all in aid of Comic Relief. The Rochdale-based comedian teamed up with the Littleborough Rock Choir on Red Nose Day (15 March) for their special fancy dress rehearsal. He also sang John Farnham’s You’re the Voice – another 80s hit – with the choir. The evening raised around £70 and choir master Phil Reynolds was thrilled that as well as joining in with rehearsals, Jimmy also performed one of his own songs called The lady From My Sat Nav. 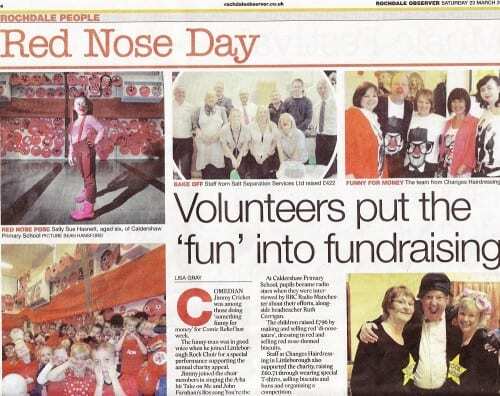 His local newspaper, the Rochdale Observer, ran an account of local Red Nose Day activities, with Jimmy featuring in two out of the four photos (above and below)! * Comic Relief is a major UK charity set up in 1985 which strives to create a just world free from poverty, raising awareness and money through activities based around entertainment. its two big fundraising campaigns being Red Nose Day and Sport Relief.